The Bonsai Album v3.0 update is now available on the App Store for iPhone, iPad, and iPod touch. Increased the photo size on the Bonsai, Pots, and Logs lists. New CSV templates for the new fields. The Artwork Tracker v2.7 update is now available on the App Store for iPhone, iPad and iPod touch. 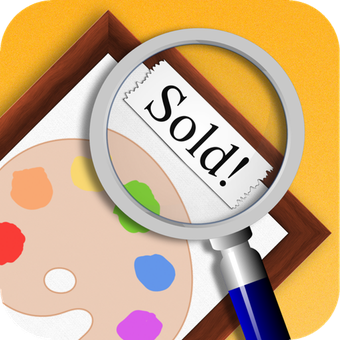 Artwork Tracker is an indispensable mobile app for artists, art collectors, or art dealers. Keep track of artwork and submissions on the go, with access to all your data and full-screen artwork at your fingertips. Increased photo thumbnail size on the Artwork and Submissions lists. If you’re enjoying the app, please spare a moment to rate or review it on the App Store! 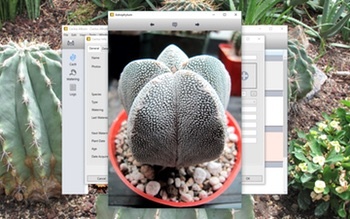 The Artwork Tracker for Mac v1.1 update is now available on the Mac App Store. For direct purchase customers, click ‘Check for Updates…’ in the Artwork Tracker menu within the app and follow the prompts to update. The following should address any questions or concerns you may have about Cactus Album for PC. I’ll be updating this post as new questions arise. Let me know if I’ve missed anything! 1. When will Cactus Album be available for PCs? 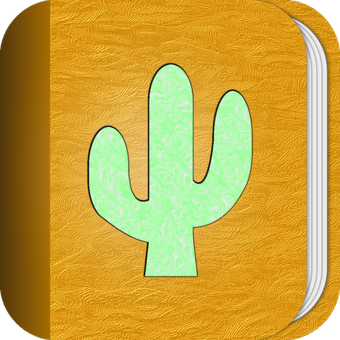 Cactus Album for PC is now available for download from my website here. 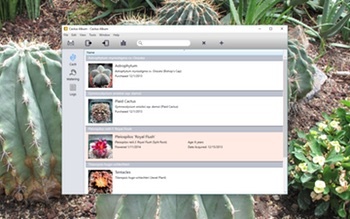 You can learn more about Cactus Album for PC here. 2. What operating system do I need to be able to run Cactus Album for PC? The app works on Windows XP SP3 / Vista / 7 / 8 / 8.1 / 10. It requires the .NET Framework 4, which will be installed automatically if your computer does not already have it. It also requires the .NET KB2468871 update patch. Outlook 2010 is required to store reminders on your computer’s calendar. 3. I already have Cactus Album on my iPhone, iPad, or iPod touch. Do I have to buy it again for the PC? 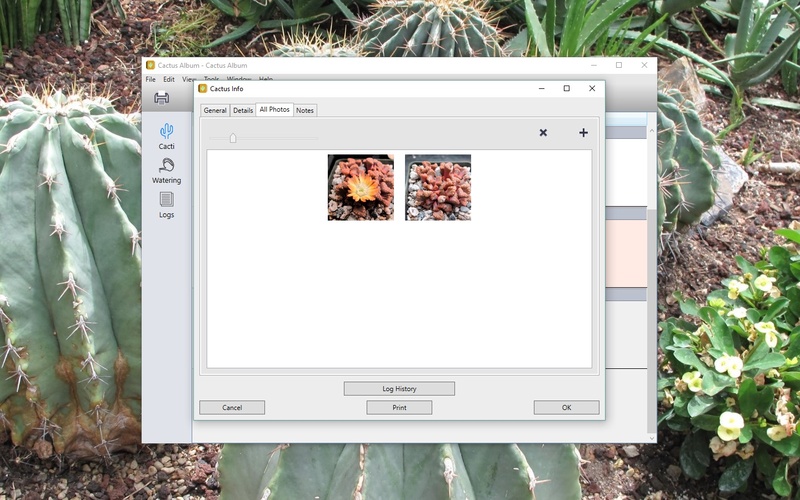 Yes, if you would like to run Cactus Album on your PC, you’ll need to purchase it direct from my site. 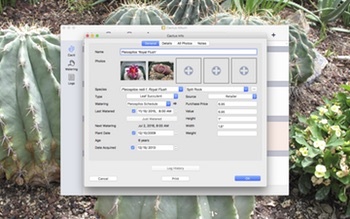 The PC version includes some additional features over and above the iOS version, including photo organization, enhanced search, and printing capabilities. The app had to be substantially re-designed and completely re-written for the PC platform. Unfortunately porting the app to the PC wasn’t as simple as you might think! 4. I’m not sure if Cactus Album for PC will suit my needs. Is there a free trial version available? Yes, it is available for download from my website here. The app is initially in an unregistered trial mode, limited to 3 cacti, 3 watering schedules, and 3 logs, with 3 photos each. It will also only allow a single database open at a time, and database import is disabled. That should be enough to give you some idea of whether the app will work for you. Purchasing a license either within the app or via my website unlocks full functionality. 5. Will Cactus Album for PC be localized into my language soon? 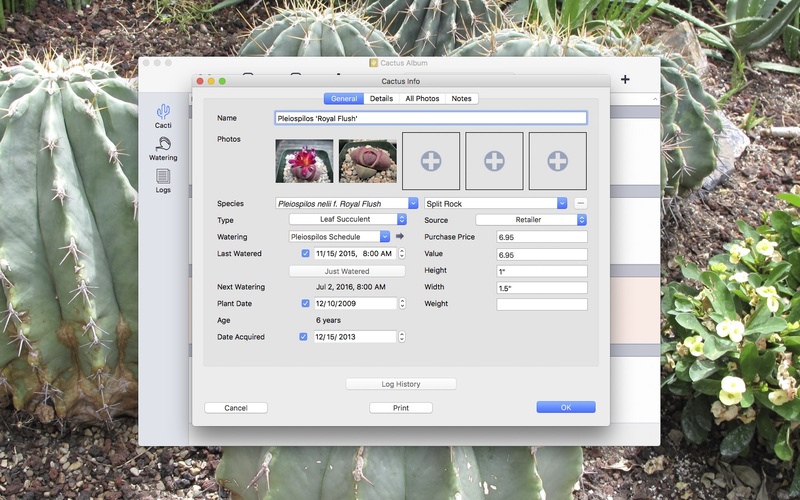 Click Preferences… on the Tools menu and select the “Sort cacti by species” checkbox under Sort Options. 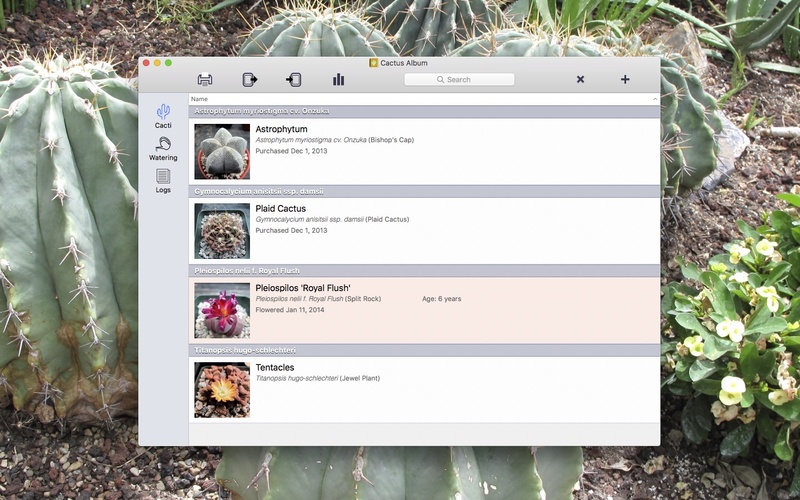 Close the window and you’ll find all cacti are now sorted by species. Repeat these steps to sort by name again. 11. I have an Cactus Album database on my iPhone, iPad, or iPod touch. How do I transfer it to Cactus Album for PC? 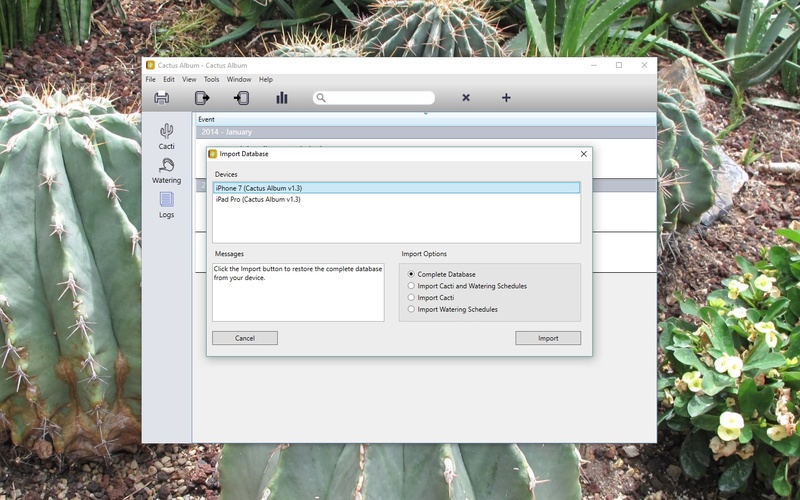 (2) Create a new database within Cactus Album for PC and save it to your Documents folder. 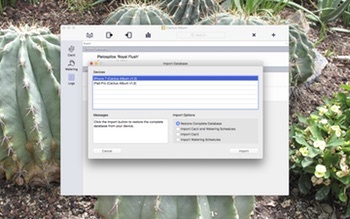 (3) Click the Import Database button in the document window toolbar within Cactus Album for PC. This is the button next to the printer button. The button has an arrow pointing to the right, away from the device icon. 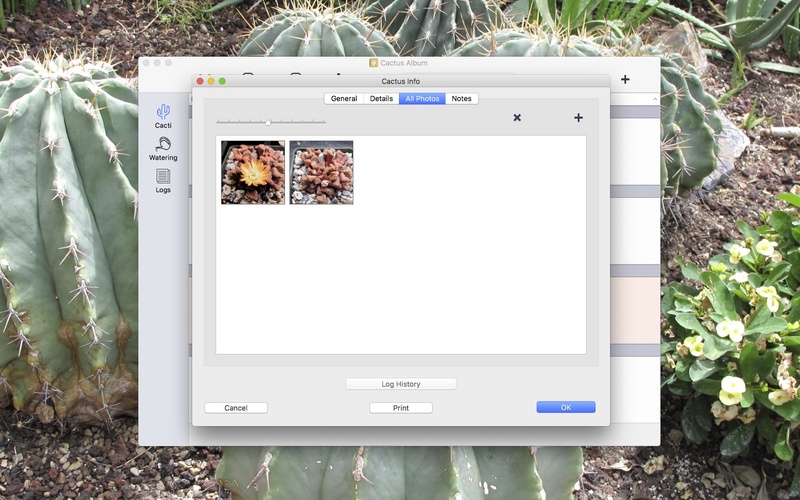 You can also select the Import from -> Cactus Album Mobile App item in the File menu. (4) The Import Database window will appear. You should see your device shown in the Devices section. 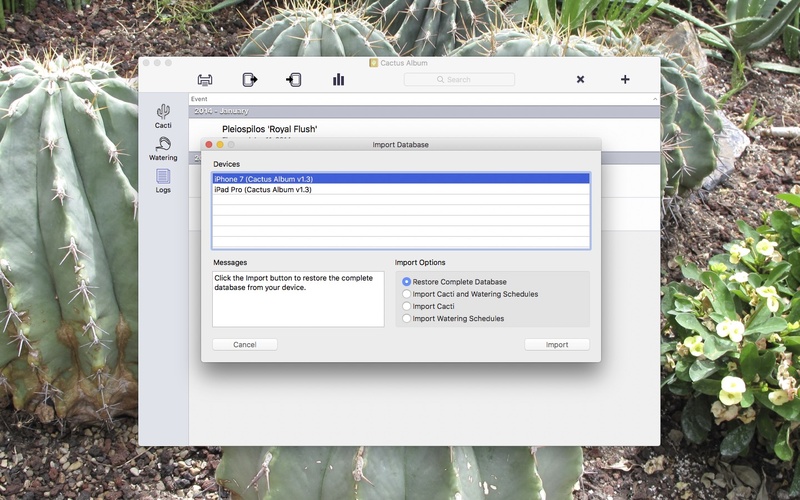 If it isn’t there, double-check that you’ve selected Backup Database (or Export Database) on the Tools screen within Cactus Album on your device. Check the Messages box in Cactus Album for PC for helpful information. (8) The database in Cactus Album for PC should now match the database on your device. Note that the above steps will completely replace the contents of the Cactus Album database within Cactus Album for PC, unless you’ve chosen not to restore the complete database. In that case, you may see duplicate entries in your database after the import is complete. 12. 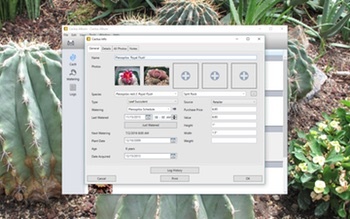 I have an Cactus Album database in Cactus Album for PC I’d like to transfer to Cactus Album on my iPhone, iPad, or iPod touch. How do I accomplish this? The steps are similar to question 11 above, except you must select either Restore Database or Import Database on your device, and click the Export Database button in the document window toolbar within Cactus Album for PC. This is the toolbar button with the arrow pointing toward the device icon. When the export is complete, you should consult the pop-up alert on your device for further instructions. 13. I have an iPad, an iPhone, and a PC. How do I keep the databases in sync between all of these devices? 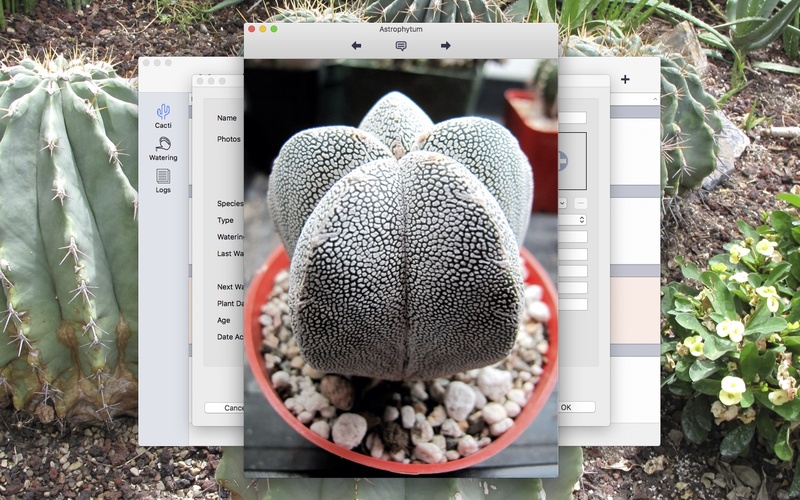 Cactus Album currently doesn’t have a simple means of keeping databases synchronized on separate devices. However, it is still possible to transfer the database between devices manually. You first need to backup the database from the device with the most current copy to your computer (or from your computer to the device). The steps for achieving this are shown above in questions 11 and 12. A good workflow is to use your PC as a hub for the database, updating that after you’ve made changes on your device. First, pick a log entry or create a new one. Select Yes next to the Reminder field, then click the OK or Save button. A popup will appear asking if you want to add a reminder to the calendar. Click Add and another window will appear where you can create a calendar entry. If there’s already an entry, it’ll allow you to edit it (or delete it). If you check your calendar in Outlook, the entry should be recorded against the date/time you set. You can reach me via email (CactusAlbum@andrewnicolle.com), on the Cactus Album Facebook page, or on Twitter (I’m @andrewnicolle). I can usually respond to queries within 24 hours. If you like Cactus Album for PC, please spread the word. Thanks! 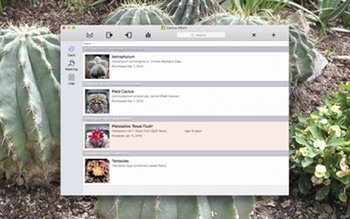 The Bonsai Album v2.6 update is now available on the App Store for iPhone, iPad, and iPod touch.